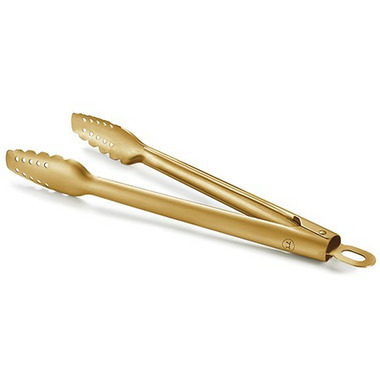 These 16-inch Outset Lux Gold Tongs are a brilliant example of elevated, durable design. Completely weatherproof, these Gold Lux tools are strengthened using a process known as physical vapor deposition (PVD), well-known in the luxury watch business. The stainless steel design is reinforced with a even coating of copper coloured titanium. The result of this process is a beautiful tool that is corrosion resistant and free from chemical binders. You never have to worry about the coating chipping. The handles lock for convenience, and the scalloped hands handle food without piercing.